This is a great competitive team mixer for the fall. Cut up pumkins into 8-10 pieces. Break your group into teams of 5 or 6. Have a supply of round wooden toothpicks. 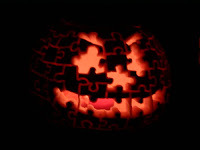 Give each group two minutes to put int "jigsaw puzzle" pumpkin back together, using the toothpicks to hold the pieces in place. The first team done or the team with the most "together" pumpkin after the time limit is the winner. Pumpkins must be able to stand up alone to be considered a winner.